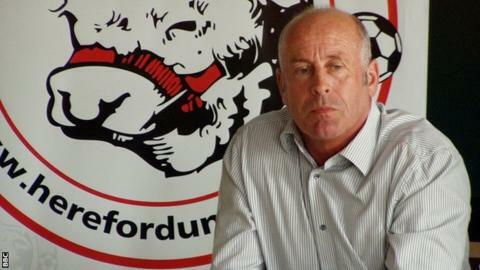 Martin Foyle has been named as the new manager of Hereford United. Foyle, 49, succeeds Richard O'Kelly, who chose to leave following the Bulls' relegation from the Football League on the final day of the season. "What attracted us to Martin in particular was his undoubted experience at this level," Bulls chairman David Keyte told BBC Hereford & Worcester. "He's a very experienced old-school manager, who did a really good job at York and took them to Wembley twice." Foyle's appointment represents the Bulls' sixth change of manager in three years since Graham Turner first stood down as boss in 2009. "We have gone through a period where we have chopped and changed a bit at management level," added Keyte. "It really is time for the club to find a bit of stability as best you can in football. He is renowned for knowing players, as well being a good wheeler-dealer. It would be nice if he was with us for the next number of seasons." Foyle, who beat more than 40 candidates to claim the Hereford job, began his managerial career at his old club Port Vale in February 2004, spending three and half years at the helm. His second managerial role came at York City, who he guided to the FA Trophy final in 2009 and the Blue Square Bet Premier play-off final in 2010. Foyle has also been assistant manager and caretaker manager at Wrexham, first-team coach at Bristol Rovers and was in charge at Evo-Stik Premier Division side Northwich Victoria in the second half of 2011-12, helping them to second place. Now he has his sights set on taking the Bulls back to the Football League. "It's a club that can bounce back but it needs to stabilise," Foyle told BBC Hereford & Worcester. "It's been a hard time, but everybody who worked here last season gave it their best shot. "Now I am the next man in to try to calm it down a little bit. "The main attraction for me was the chance to build a club again like we did at York and you can see where they are now - back in the Football League. "But it is a chance for me to get my hands dirty again and I can't wait."